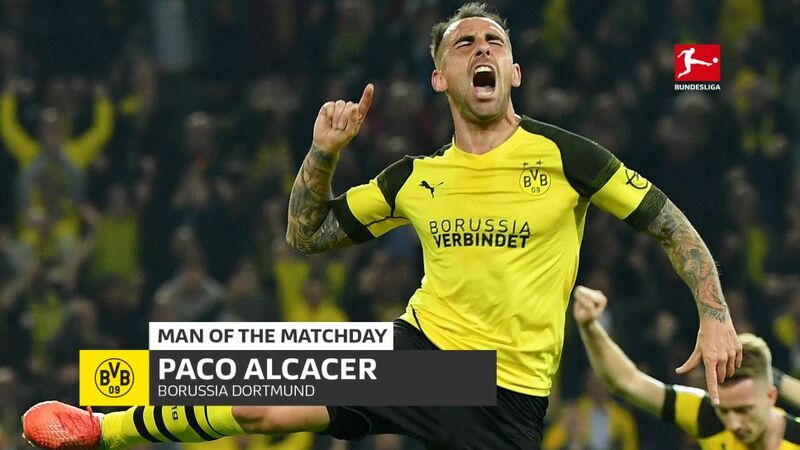 Paco Alcacer insists he can be Borussia Dortmund’s next great goalscorer, and his debut strike against Eintracht Frankfurt on Friday suggests that the Spain striker’s claim that he can emulate Pierre-Emerick Aubameyang and Robert Lewandowski might not be far off the mark. Alcacer was Die Schwarzgelben’s final acquisition in a busy summer transfer window, signing on a season-long loan deal from Barcelona. Starting from the bench at the Signal Iduna Park on Friday, the 25-year-old entered the fray for the final 25 minutes and wasted little time in endearing himself to the Yellow Wall, beginning the move that led to Marius Wolf’s goal before completing the scoring at 3-1 himself late on. Paco Alcacer too slight to be a hold-up player? Standing at just 5’9”-tall, some sections of the Dortmund support had worried that Alcacer might not be the hold-up player they have become accustomed to in recent years, with Lewandowski, Aubameyang and most recently Michy Batshuayi each packing their black and yellow shirts with plus-six-foot frames. Alcacer is having none of it though, as his words - and actions - show. “I like to play with my back to goal!” he told bundesliga.com. “I like heading to the near post in search of the ball but I especially like participating in the game with my back to goal. I always looked at players like Lewandowski and Aubameyang - the way they play; the way they move. I’ll try to play like them to make the fans happy." The way Alcacer linked up with Marco Reus and Jadon Sancho in the final third augurs well for BVB. Restricted to just 14 La Liga starts with Barcelona over the last two season, there were suspicions that Alcacer didn’t fully click with Lionel Messi at the Camp Nou. A change in footballing philosophy is just what the striker was looking for. Alcacer pulled his thigh muscle after scoring against Eintracht and could miss Dortmund’s UEFA Champions League clash against Club Brugge on Tuesday, but is expected to be back in time for their meeting with Hoffenheim next Saturday. After his fine 25-minute cameo on Friday, BVB fans are already licking their lips at the prospect of a quick return for a new goalscoring hero.